Every good kitchen habit has to start somewhere. If one of your New Year’s resolutions was to eat healthier, cook more, or try new recipes, you could sign up for culinary classes that you may or may not go to, purchase a few recipe books in the hopes that you’ll one day flip them open, or you could follow a few chefs’ Instagram accounts. The success of Instagram in creating good kitchen habits lays in the fact that progress happens in the most subversive ways. You may be in bed one morning, scrolling past your coworkers’ OOTDs and Kourtney Kardashian’s latest baby pic when you stumble upon a scrumptious-looking (and deceptively easy) chicken noodle soup with sweet potato and cilantro. And just like that, dinner is planned. The key is in knowing which accounts to follow for recipes that not only look good but taste the part too. If you follow enough of them, you’re bound to never run out of great recipe ideas to test your culinary horizons. Ready to take your cooking skills to a whole new level in 2019? Here are some Instagram chefs that are simply too good to pass up. For serious food envy and great recipes, look no further than Alison Roman’s Instagram account. When she’s not eating her way through New York City, she’s contributing to The New York Times or Bon Appétit magazine. Her first cookbook, Dining In, is a treasure trove of achievable and delicious recipes. This chef and globe trotter isn’t only good at posting photos of incredibly delicious-looking fresh California food, she’s also pretty great at explaining at length how to make each recipe with her how-to tutorials. If you want to learn how to make anything from a great cheese board to cauliflower alfredo pasta, What’s Gaby Cookin is your gal. What happens when you put a food stylist and a food photographer together? Spoon Fork Bacon—and we’re all better for it. Learn how to make anything from creamy vegan squash bake to wild mushroom, turkey sausage, and kale farro risotto—every post links back to a recipe on their blog so you’ll always have a detailed how-to. The Food Minimalist was founded on the principle of sharing easy and minimal recipes that require few ingredients and little time. In fact, the recipes are so simple that they are often shared directly in the photo caption, meaning you never really have to leave Instagram from start to finish. Follow this one for weeknight dinner inspiration. At only 22 years old, Tieghan Gerard of Half Baked Harvest has already won awards and written a cookbook. Her Instagram account is filled with highly stylized dishes and how-to videos. Most dishes link back to a recipe on her blog. If you want to learn how to make anything from Indian coconut butter cauliflower to simple cacio e pepe, she’s one to follow. Diane Morrisey is a mom of six, recipe developer, food stylist, and caterer—not to mention she has an impressive Instagram following. Her account is filled with kid-friendly and easy recipes that will help you hone your skills in the kitchen, from healthy Asian salmon bowls to chai pear scones. Gather and Feast is an Instagram account by Ashley Alexander, founded on the principle that food should be beautiful and simple. Recipes are perfect for entertaining: tomato toasts, chocolate truffles, pasta bakes, and more. Alexander also has a free recipe ebook available on her Instagram in case you need extra dinner inspiration. Dennis The Prescott is a cook, photographer, and writer. His cookbook, Eat Delicious, features comfort food from around the globe. On his Instagram, Prescott shares delicious dishes like pappardelle with creamy garlicky lemon chanterelles and smoked salmon pizza with poached eggs, avocado and whipped goat cheese—all linking back to recipes on his blog. As an editorial and test kitchen director, Jake Cohen knows a thing or two about food. His recipes regularly appear in publications from Food52, HuffPost, Food and Wine, Saveur, and Purewow. 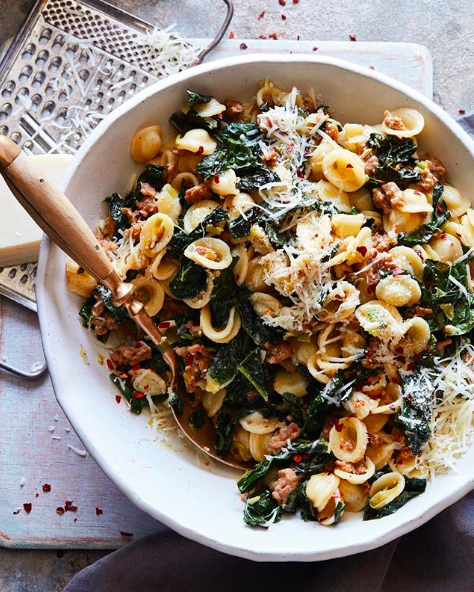 On his Instagram, Cohen shares his latest recipes: perfectly twirled pasta bowls, scrumptious baked goods, and perfectly assembled cheese boards. Food stylist and recipe developer Ashley Marti has a knack for sharing beautifully styled and photographed dishes that also look healthy and hearty: brothy chickpea soup with miso, roasted sweet potatoes, kale, and egg; sesame noodles with crispy tofu; ramen noodles with miso pesto. All her recipes are also shared on her blog, Local Haven.